The Tree Peony Company - Containerised, named Tree Peonies for sale. 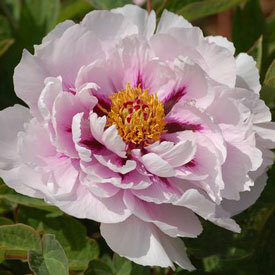 Tree Peonies ('Paeonia suffruticosa' and 'Paeonia rockii') are hardy, medium sized, deciduous shrubs. Unlike the more commonly grown herbaceous peony (which produces shoots from a tuber then dies back to ground level each year) the Tree Peony produces woody stems which will grow larger each year, eventually reaching between 1.5 and 2 metres in height and/or width. Tree Peonies flower from April to mid-June, depending on variety, producing large, scented, single, semi-double or double flowers. These 4 and 5 year old containerised, named Tree Peony cultivars have been imported directly from specialist nurseries in China and have been grown-on to ensure viability. Our Tree Peonies are normally supplied in 4 and 7 litre pots.